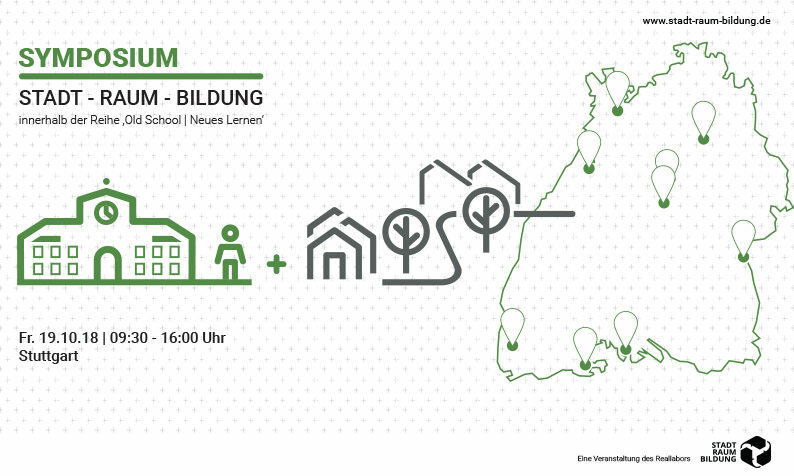 The „Realworld Laboratory STADT-RAUM-BILDUNG“ (City Space Education) invites experts and interested people from the fields of education and planning to the last symposium on Friday, October 19th 2018. Preliminary results and findings will be presented to the public. The Reality Lab „STADT-RAUM-BILDUNG“ (City Space Education), run by the University of Stuttgart, in conjunction with SRH University Heidelberg, Pädagogische Hochschule Heidelberg (School of Education), and supported by various partners, focuses on schools and their relevancies in today’s challenges of education and social contexts. Learning in the digital age, inclusion, full-time schools and new forms of learning are just a few key words to describe the paradigm shift taking place in our schools. This shift presents a range of challenges when it comes to renovating and modernizing school buildings. The specialized knowledge of those involved these changes is paramount when it comes to developing use- and user-oriented solutions. This symposium will provide the framework for a discussion between community representatives and other involved experts, focusing on the extent to which the current definition of schools as “places for learning and living” can be understood as an urgent planning task in present and future. The aim is to devise solution-oriented approaches for the reorganisation and modernization of schools not only as buildings but also as institutions in the future, and for the redefinition of schools of their roles within the neighbourhoods and communities. It is important to understand school buildings not only as learning and living spaces, but also as significant, socially sustainable components of our society. Please register before October 10, 2018 by email to stadt.raum.bildung@si.uni-stuttgart.de.